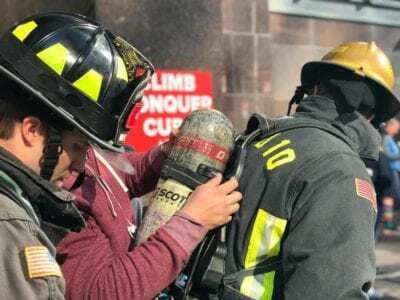 More than 2,000 fire fighters raised $2,472,223 on Sunday, March 10, climbing 69 flights of stairs at the Columbia Center in downtown Seattle. Many of the participants were WSCFF and IAFF 7th District members. Clad in full turn out gear, they carried photographs of colleagues and family members who have suffered from blood cancers. Bill Kotzin, Local 469, Yakima represented Hailey Hutchins — and she was on site to cheer him on. Funds raised support the mission of the Leukemia and Lymphoma Society. Since the Stairclimb started 28 years ago, $17 million has been raised for patient services and for research to find a cure for this terrible disease. Local 46 Everett was the top team, raising $107,427 and Local I-66 Boeing member, Marina Fox, was the top individual, with $24,872 raised. Congratulations and thanks to all who participated.